Guy Palumbo Takes Low Road- or Guy Palumbo Never LEFT The Low Road. 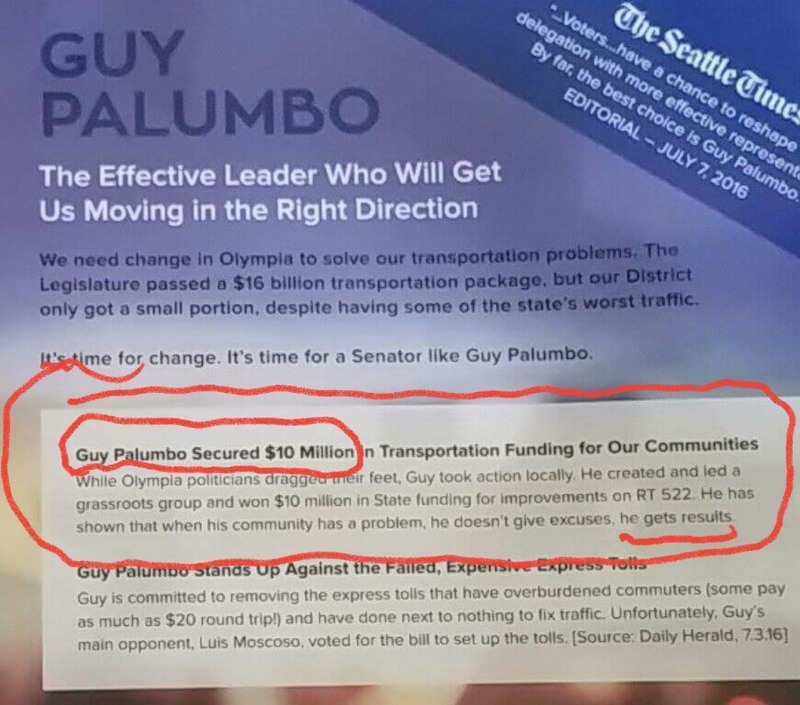 It would appear that some of Guy Palumbo’s supporters are concerned because Guy Palumbo has been called out for lying about his contribution to the Transportation Package Rep Moscoso actually did the work on. Once again his campaign is coining phrases like Guy being one of ” little people” who wrote letters to Olympia just to remind you who the big bad Latino is- I guess they have to have one more good hard blow on that dog whistle. Guy Palumbo just can’t help himself. One could say that resorting to character and cultural assassination is what happened during a nasty campaign season- but the perplexing things is WHY Palumbo still needs to do that to Rep Moscoso. 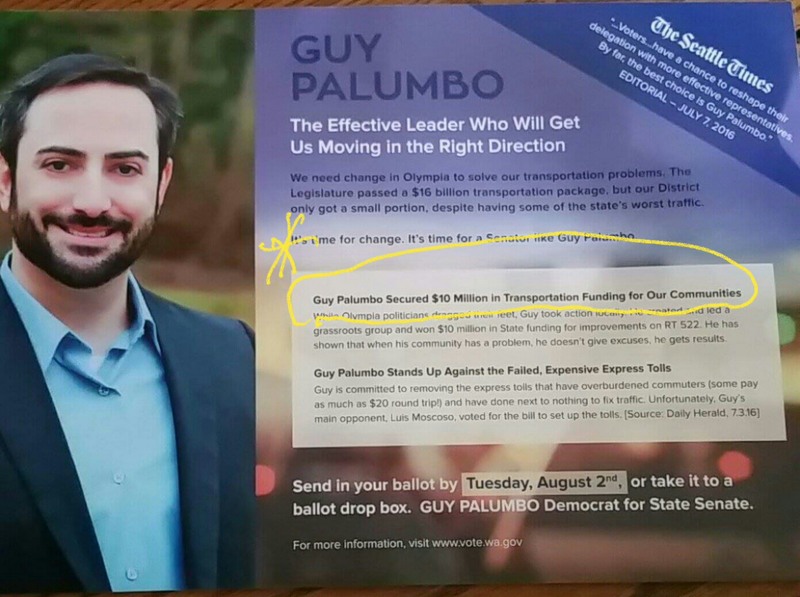 So I will bring up a couple of points- they are worth mentioning because they demonstrate the same lack of respect for my family that Palumbo ran on, but that he is clearly patronizing and showing a lack of respect to the Voters by his continued attack on their intelligence. Guy Palumbo did spend time in Olympia-only he hung out at hearings for Education ( literally, he stood in the back of the room and played on his phone ) Guy Palumbo had the chance to be at Transportation hearings, but he chose NOT to. And let’s be clear, Guy didn’t run on being the Leader who mobilized a community, he didn’t even MENTION that he was a part of a letter writing campaign. Guy Palumbo never once contacted me about his concerns regarding this issue. Sen. Hobbs & Sen. Liias, Minority Ranking Member and Asst. Minority Ranking Member, both contacted me as Co-Vice Chair of the House Transportation Committee to introduce legislation to improve SR 522 after it was cut from the original Senate Budget. I submitted the request and it was added to the final budget because of my effort. The Legislature has the documents to prove it. I corrected Guy months ago about this in front of the Seattle Times interview panel when he tried take credit for my work then. Rep. Judy Clibborn also said he was “wrong” in her Everett Herald LTE, July 8, 2016. My District has voted for the Democrats- and for good reason- they were solid candidates. I am sure that if Guy Palumbo were to go to Olympia the only person he will be serving is himself- he has a proven track record of doing exactly that.